As the summer draws to a close and Autumn gets closer, we look back at one of our most famous projects, which will have been seen by an unprecedented number of visitors during this record-breaking summer. The Jubilee Clock Tower, Weymouth. The Jubilee Clock tower is steeped in both history and tradition, standing on the esplanade of Weymouth, at the heart of the Dorset coastline. However, the clock originally stood closer to the beach before the esplanade was expanded and the clock tower was moved further back from the sand to protect it from the many weather fronts. 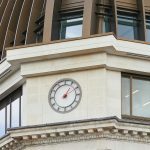 The original clock was donated by Sir Henry Edwards whilst funds were raised and manufactured by Thwaites & Reid of London before we were approached in 1960 to redevelop this historic timepiece. 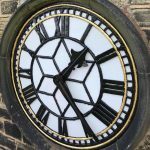 Following this we have maintained this prestigious timepiece and have recently completed a restoration on the four 4×6” illuminated cast skeleton dials. The clock was a major feature of the 2012 Olympic games, as Weymouth held the sailing competition where thousands of visitors lined the coast and stood around this colourful clock tower.